Kamol Tassananchalee’s art presentation at the Los Angeles Artcore Center in Little Tokyo from May to June is a close-up to his expressive practices with his two recent series of water colors on paper, Under the Western Sky and his spiritual cosmic large paintings on canvas titled The Four Elements. Tassananchalee’s or Kamol as he is mostly known by friends is involved in organizing student cultural art exchanges between his native country Thailand and the Unites States. He has taught at UC Berkeley and has given lectures at Lamare University in Texas. He has participated in international art biennials. Kamol’s travels between his studio in the United States and Thailand have enriched his subject matter and exposed his process of creating to a wide range of diverse landscapes. With Under the Western Sky Series, Tassananchalee explores the great natural landscapes in Arizona, California, Utah, New Mexico, Colorado and Texas. Tassananchalee describes his water color series as a moment to capture before an escaping impression. He feels such moments deserve to be immortalized. In this series horses are seen grazing in endless sea of terracotta’s while others gallop with graceful gestures to spontaneous strokes of water colors. The merge between colors is a borderless fusion. His sporadic scenic watercolors drip and move with an unbound sense of energy to create the depth of nature’s natural beauty. There is a Native American free spirited flow in this series. The space is boundless with a topography that can be seen and felt. Tassananchalee draws in-timid encounters with majestic moments. With his series, The Four Elements Tassananchalee amplifies his spiritual and cosmic philosophy. It is personal to his way of being. The reds, blues, and bright colors resemble a universal cosmic spectrum. Each engaging color used by Tassananchalee is a result of an exchange of energies in the midst of fusing and un-fusing. The making of patterns is a dance of meditation with drips and layers in between. It is a mapping of paths and journeys. There is an indefinite journey that merges with deep emerald greens that graduate in all directions. It is the key to the higher spirit and his homage to the four elements: wind, fire, water, and air. A series of four circles represents Buddha’s journey. The zig zagging reds with white embryo like shapes and circles seem to carry the path finding foot prints of Buddha’s life. His paintings share the fiery orange glow resembling hot ambers. He creates an environment of comfort that contemplates moments of mediation. The eye is allowed to travel in all directions with no confinements. Tassananchalee achieves a cultural exchange between diverse philosophies and ways of seeing art. His work invites you to explore the many ways he is inspired to create from the puppet wooden mixed media frames used in Thailand to the Valleys of California and deserts of Arizona, all share Tassananchalee’s spectrum of life. His colors are no doubt those so often seen through the lens of a telescope millions of years away. The traveling might seem far yet it is the same road that has given birth to all that we know, see, and experience. His work brings us closer to the many bridges that facilitate and extend the humanities journey. Unconstrained and undefined the paintings on canvas are full of action and simulate the workings of the four elements in motion. This process is unique to Tassananchalee’s technique and creativity. In his first solo exhibit at L.A. Artcore Center for the Arts in little Tokyo January 2018, Kio Griffith’s body of work is an interdisciplinary display of paper collage, sculptures, and a video installation. He was born in Kanagawa, Japan and is based in Los Angeles as well as in Japan. Griffith is an independent curator, writer and producer. He studied at Otis/ Parson School of Design and has exhibited in the United Kingdom, Japan, U.S, Croatia, Belgium, China, Germany and several other countries. His artistic projects include the creation of over 300 hundred music covers designs. Griffith participated in the Aichi Triennale 2016 in Nagoya, Japan. He also writes for art publications in the U.S. and Japan. In 2017 Griffith was presented with the Emerging Curators Award by the Los Angeles Contemporary Exhibitions (LACE). Griffith’s In(Poetry)2dexed was inspired when he and his family discovered a series of diaries. He realized then the incapacity to read all 50 years of dairies written by his father. The cryptic title of this display of work makes reference to the process of shuffling information to find meaning. Since his father’s death, a decade ago, the quest to make sense of his father’s attempt at reinventing himself in a foreign country recorded in his daily journal entries, became Griffith’s point of departure for this body of work. The inherited literature would lead to a minimalist yet profound interpretation of the physicality of reading and the exteriority of memory as a lived experience shaped by chance and surprise. Material of choice for the collage works is collected newspapers from different countries: cut, layered, and indexed with a steel pipe acting as a pressing tool that joins approximately the one inch thick paper together. The practical use and versatility of newspaper is a close up on the everyday exchange of local, regional, and international narratives. Unlike the techniques of dada and cubism of deconstructing, Griffith does the opposite, he is re-contextualizing how information is gathered, assembled and structured to create content, memory and communication. Multiple prints in each of the newspaper sheets crypt together turn into a barrage of diverse languages, all speaking at once. The residue of this integration for Griffith becomes a question of how to integrate this new language that coincides with random creations of meaning. Impoverished materials are revived with the aesthetic virtues of simplicity and selflessness. There is a concern to rescue materials discarded as no longer useful by today’s modern society. Discolored and wrinkled this body work is tapped with conversations that extend from the faded edges. In one of his Algorithm’s a random image of Chinese dissident artist Ai Weiwei is captured dropping an ancient urn to the ground. Another Algorithm titled, One Billion Dollar Embassy 2007, contains words like chance and choice. Algorithm: Frequency Retrofit/White 2017 seems to be suggesting the shoring up of structures with frequencies tuned to whiteness. There is an invitation to figure out what to make sense of, what remains and what leaves us, a la Wittgenstein with titles that can be associated with absurdity, politics and identity. His salvaged book sculpture series, the visceral affect of sculpting is re-associated by space that occupies the sculpture. For Griffith, the modern masters of modernity work of art entail the act of much reading. In An American Tragedy 2017, a paperback with tape sculpture is structured as a literal statement with the cover’s original title as an instant message. Unlike the masters, it is a sculpture that embodies today’s post modern era of text messaging without the body of literature in the book as its vertebra. The instant text-like charge of the title carries a deep political reflection of today’s means of communication and current political circumstances in American politics. The original titles with minimal words nevertheless are strong and bold enough to stand on their own. It is a sculpture series that preserves some of its originality that accompanies the process of re-inventing while pushing the viscosity of the message in ones direction. Offshore Drilling Technology, 2017 is one of Griffith’s high viscosity book cover and tape sculpture that drills right into the core of environmental concerns. Several incised orange book covers in the exhibition have been converted into open pockets. The openings seem to be gashing out for air allowing life to precede its venture into this new born cavity. It is a susurro! (A Spanish word that means a deep breath of air that most often expresses what words cannot). The video installation titled Algorithm Counter is a visual monochrome composition that spins like a casino slot machine; it is driven by chance and random. It is a rotation that involves the timing of letters engaged with past and present to re-associate new hidden possibilities. It is the work of shuffling new combinations of letters that challenge fixed ways of knowing that Griffith brings to light: conservative social and political values that infringe on the process of creativity. He describes, “If you go too conservative you lose the opportunity of taking chances.” He further elaborates, “Conservatism to be the antithesis for creativity.” In this video letters rotate and stop simultaneously to birth and register meaning as marking and forming. Griffith’s multidisciplinary approach gathers all his art disciplines; music, installations, performances, video and traditional methods of creating that emphasize the human spiritual frequencies that help readjust our relationships amongst one another. They are playful and welcoming. He squeezes the juice out of letters and meaning, pressing together multiple languages to coincide with random interpretations layered over existing social and political concerns of the artist. Griffith questions the ownership of words and meaning with chance as his interceptor. The reviving that follows this series is his attempt to jump start hope in the era of texting. He rescues history by re-sculpting the process of words and literature by depositing layers of ideas that act as sediment that upon excavation can be an archeological treasure. This exhibit brings for Griffith the opportunity to pay tribute to his father and the teachings of chance that coincided with selflessness and creativity. It is an exhibition that opposes the hegemony of assembling one-dimensional thinking. The political connotation in these paintings reflects the tension between the colonizer and the colonized, oppression from within and the political imposition of western countries. Battle of Algiers is a group of paintings that superimpose the fight for self determination by Arab nations in the likeness of an artist who struggles to find a path to un-constraint every stroke dashed onto a canvas. For Peterson, “There is no war here in Pasadena, but still you read the newspaper, you watch the news, and those things affect you. I start with an image or an idea that has some personal meaning and use, that is a beginning.” The compositions in Battle of Algiers are asymmetrical. There is an aggressive gesture not in the drawing, but in the content of the drawing. There is an absence of despair and a presence of struggle in Battle of Algiers that consolidates with the hopes of a colonized people. The presences of ghostly silhouettes are obscure, undefined and faceless. In Battle of Algiers XIV, 2016 a sunflower yellow with hidden taps of gold become the skyline above what seems to be a gray pale lifeless battlefield. In the forefront of this scene two standing figures in green gather around a dark murky outline on the ground, surrounded by strokes of red. In Springtime 2011, with short wiggling strokes Peterson camouflages a lifeless soul amongst a promising spring. Bogdan Dumitrica’s series Fearful Symmetries is an inviting collection of oil paintings renditions on paper of natural organic remains. Exhibiting at Los Angeles Artcore Center for the Arts, his series consists of fifteen 44”x 30” artworks. Dumitrica received his Master of Fine Arts degree from California State University, Los Angeles in 2001. In 1995 he was awarded the Art Matters Foundation Grant. He has exhibited at international art biennials in Egypt and Korea with his ceramic works. His art has traveled across the United States and Europe exhibiting his creative endeavors. An admirer of classical contemporary music and literature, Dumitrica draws inspiration for his most recent artwork from composer John C. Adams’s 1988 animated and expressive musical with the same title of the exhibition; Fearful Symmetries. Pinned directly to the exhibiting walls with no interlocutor in between, Dumitrica’s organic depictions of decomposed cactus leaves, branches and fibrous natural objects spatially navigate between negative space and the projection of weightlessness.The void surrounding the organic images allow him to develop a three-dimensional illusion on a two dimensional flat plain. His chosen color scheme are desert warm subtle off-whites, ochre, light greens and grays with gentle strokes of amber. The minuscule details of the crevasses and contours enhance the aging state of each painted. The journey of decay and weathering are for Dumitrica, the documentation of accumulated time recycling itself through an organic process. In Dumitrica’s work, the organic found objects have acquired a binary connection with the inorganic manmade objects. His Pistolero series one through five, paintings of dried wood branches can be seen as inorganic renditions of antique pistols. A second painting of a dried out, long extensive curled leaf simulates a propeller. The same can be said of a decomposing desert flower titled Stellar Regions that resembles the mapping of a star constellation. With Egyptian Forms Dumitrica captures the beautiful cylindrical forms of Egyptian rural bird houses build of mud. The use of natural elements in the construction of the birdhouses releases, at first sight, a mystery and wonder. There is a scene of pleasure in viewing the birdhouses in a most natural state. The idea of appearing, disappearing and recycling reveal a process of existence in a world that is constantly fusing and un-fusing. His low profile double play with organic and inorganic materials and forms unveil a connection between cultural symbols and daily use objects. Time is of the essence in this series, it is the main character that gives identity and meaning to his work. Dumitrica brings out the beauty in decay. He also poses a question between finite and the infinite. The endlessness of time dissipates with coming of erosion and the cycles of all the weathering elements. The sense of suspension in his paintings can be compared to that our planet suspended in a universe constantly remaking itself, while the negative space questions natural weathering vs. the unnatural and manmade decomposing ways of destruction. John C, Adams’s composition Fearful Symmetries is a revealing musical that ties in very well with Dumitrica’s paintings. Both question life. Both reveal the mechanical material objects and the impact it has on our daily lives. Dumitrica exposes our time as a minute moment of existence with the hopes it can reflect a more harmonic revelation of what we produce and what we become. At Any Cost is the title of artist Carla Viparelli exhibition at the L.A Artcore Brewery Annex. The electrifying and provocative title puts the perils faced by migrants from the global south who seek refuge and a better life in rich countries situate in the global north. This exhibition at the Brewery Annex ends her four month residency in Los Angeles California. Viparelli’s multidisciplinary career extends from a Master in philosophy from Naples University in Italy to international art workshops around the world. At Any Cost originally began as a video Installation which later turned into painted canvases. The exodus and departure from the global south is best depicted by Viparelli’s archeological approach of unearthing to rediscover and reveal an old and ancient practice by all prior cultures and civilizations; migration. Viparelli’ series touches on three aspects of her exhibition, The Myth, The History and The Present by simulating ancient fragments of Roman clay pottery as her springboard to an open conversation on today’s migration. The juxtaposition between pottery fragments decorated with ancient pictorial patterns along silhouettes of children, men and women exposes the search and journey of migrants in a state of uncertainty. There is an ambiguity as to how migrants will be viewed either with suspicion or apprehensiveness or with benevolent eyes from the north can reveal embedded myths and stereotypes. Through this metaphor Viparelli draws a closer examination via the arts on a heated subject that is often demonized and misunderstood. Her animated video installation projects a shadow of a voyaging ship onto the bottom surface of what simulates the base of an ocean floor. The shadows cast rowing arms thrusting across a body of water with fragments of scattered clay pottery. The faceless images of unknown people are stamped by the magnifying sun at the bottom of an ocean. Viparelli brings to light the concealed and invisible faces in search of a landing they can call home. Viparelli’s work is active and an engaging philosophical dialogue that attempts to piece together a fragmented narrative between western perceptions of otherness and the contributing colonial factors that have more than often impeded the global south its own self determination. This exhibition is an interdisciplinary act that questions current world affairs and its collective responsibility to bring to evidence the push and pull factors that have forced thousands to flee their home. It is a timely exhibition during xenophobic reactions in Europe with the arrival of migrants and refuges from the Middle East and Africa, and anti-immigrant legislation in the United States with the building of a wall along the border between The United States and Mexico. Viparelli’s art is a sensitive response to an urgent historical moment that seeks to make sense of it all. Artist Wakana Kimura is an MFA graduate of Otis College of Art and Design and has a BFA from Tokyo University of Fine Arts. 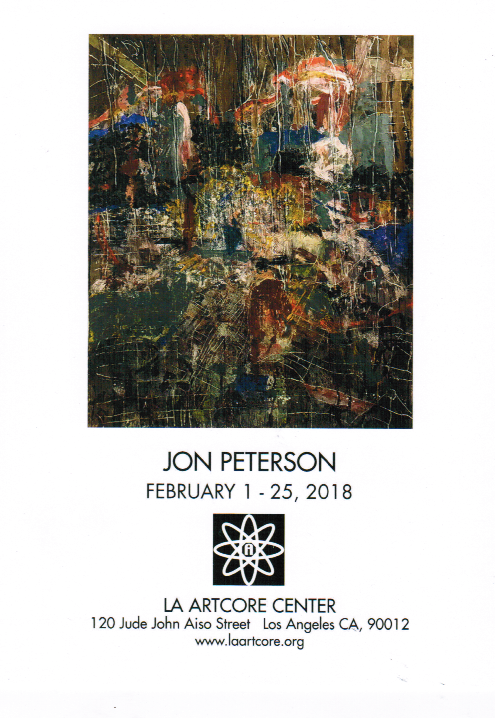 Her Exhibition at the L.A Artcore Center in Little Tokyo presents her most recent mixed media visual narrative series: Heavenly Maiden and Daily Practices on paper. Originally from Japan, Kimura now resides in Los Angeles CA. She’s recently been awarded the Cultural Trailblazers Fellowship Award by The Department of Cultural Affair of Los Angeles and is currently exhibiting artwork at the Los Angeles Union Station Metro public art program: Through the Eyes of Artists. Her daily art ritual begins with a series of what she calls Daily Practice consisting of small intimate drawings. This series is a meditation of spontaneous practices of short washes consisting of multiple colors brushed and dotted abstract patterns on 4”x6” paper. For Kimura, such practice is a way to keep the hand rhythmically tuned and exercised for larger pieces that measure up to 35 feet long. Daily Practices are instant flashes of interactions between simple and beautiful unforeseen shapes with a fluidity that radiates a sense of tranquility and inner peace. This practice is the birth that inspires her larger calligraphy style paintings. The main centerpiece of her Heavenly Maiden series is a large 77”x98” mixed media painting on washi paper roll Titled: Nirvana/The death of Buddha, 2017. This piece commemorates the passing of Buddha’s life on earth to the ultimate afterlife goal of an enlightenment being also known as nirvana. The spiritual leader’s death took place 2500 hundred years ago on February 15 under a silvery moon which is depicted in the painting. Buddha is seen in a state of serenity no longer living the negation of desires that bring much suffering. It is a scene surrounded by mourners, men, woman, elders, and animals in grief witnessing the departure of Buddha to nirvana. The spiritual leader left behind all privileges of royalty while seeking the true purpose of life. It is done with watercolors, markers, and Sumi ink, in midnight blues layered between reds, pinks, violets and small hints of gold. Kimura is very much interested in looking at the different interpretations of Buddha’s Nirvana departure by other artists beginning in India spreading through diverse regions of Asia and other places across the world. In this particular piece Kimura shares the translucent overlap process that reveals her approach and technique. She assembles the narrative of Buddha’s death with expressive imagery and patterns done with quick short and longs wide brushstrokes of paints that swim in every possible direction. Kimura brings a refreshing Japanese heritage in this body of work. It is a combination between contemporary styles and traditional methods. It is here were she reveals the magic at the end of every brushstroke she performs on paper. Kimura captures in her art a spontaneous process between beauty and the mystery behind the constant change of life. She adds energy to the visual experience that can center at any given point without losing sight of the total sum of lines, curves, and shapes invested in every artwork she creates. Inspired by the making of nature and its millennial contribution in creating what we know as the biodiversity that lives and breathes amongst us all is the point of inspiration for Hiroko Yoshimoto. She was born and raised in Japan before moving to Los Angeles. She studied in the University of California, Los Angeles (UCLA) graduating with a BA and MA in Art. She has exhibited throughout the state of California and Japan. Her most recent exhibit series, Biodiversity presented at L.A. Artcore in Downtown Los Angeles brings forth the unseen relevance of nature to our existence. Yoshimoto’s work draws from reading American Biologist E.O. Wilson who emphasizes the importance of diversity amongst the species and how through a mutually-inclusive understanding of the role each species plays, and its importance to preserve humanity. To save the natural diversity for Wilson is a fight for life. Yoshimoto experiments her intuitive creativity on canvas. Her abstract paintings explore the multiple dimensions and layers found in the organic world. She is intrigued by the individual’s sensorial response to the concept of her paintings. The paintings are organic shapes in the process of unfolding in flight and movement. Her expressive input in this series done with kindness and reflection is a conversation with the biodiversity as a landscape of life. She selects a palate of colors that are soft and loud simultaneously. Her chosen medium is mostly oil on canvas. Yoshimoto’s canvases are detail-oriented and multilayered with no hard edges. At times, her lines and curves interact in ways that draw patterns associated with nature: plants, birds, and butterflies. Yoshimoto’s emphasis pictures the micro inter-related activities of life growing and stretching its boundaries and limits. Her process starts with doodling, intuition, and memory on paper then transitions and maps onto the canvas. One can find no center nor a point of perception to win our attention to a specific area, instead she invites the viewer to explore in any direction. This body of work is unstructured expressions of micro-life amplified, from its concealment to visibility. Each brush stroke in her work is a response to the one before and the one after. Yoshimoto’s watercolor on paper with Japanese ink merges in space, blending a dance of multiple encounters. They are sound waves that move to the flow of her imagination, like a Sonata resonates with every pitch of color. Different shades of gray fuse creative tints and highlights. One stroke of ink by her hand allows the ink to take shape in any unpremeditated way. It is her means of sharing the spontaneity of life and imagination. This body of work is playful and serious. It invites the viewer to celebrate all that we cannot imagine which is crucial to the biodiversity of our existence. The extinction of one creature or a plant by man’s destructive actions withers away our humanity. In this series with all its dimensions of communication bring the future in view in hopes that we come to understand what is at peril. Renée Amitai's September Exhibit "Fly & Bloom"
Architect and French Artist Renee Amitai exhibiting artwork at L.A. Artcore Brewery Annex in Downtown Los Angeles is an exciting culmination of oil on glass, canvas, and mono prints on Mylar. Amitai is a graduate from l'Ecole des Beaux Arts de Paris, France. She gained professional experience in design and architecture in France, Israel, Italy and America. She is an international artist whose exhibited all over the world since the mid-1990's. Her abstract oil series on glass Fly and Bloom recalls golden sunrises and deep blue hued dusks that are welcoming pauses of inspiration. Amitai’s paintings act borderless and timeless on glass that have no end but only beginnings. They inspire to imagine what it might mean to bloom and fly. This series touches on subjects of growth, discovery and challenge prescribed notions of happiness. Her paintings unfold the mystery behind all acts of nature. She brings color to speak and engage with the spectator through a color combination that never ceases to share her most profound sentiments of hope, liberty and harmony. Her blue hues remind one of a Paris dusk performing the welcome ritual of a new start that comes with every sunrise. Her technique spreads across the canvas with the moving delicacy of a Ginkgo leaf engaging dancing the wind. Amitai’s work transmits sensitivity, simplicity and warmth. She is playful, yet willing to challenge any obstacle that impedes blooming and flying. Her titles are poetic assemblages that gathered together become Haiku’s like her paintings; Gingko in the Wind, Gingko and a Bird, A Glorious Morning can be a New Beginning. Barbara Kolo's paintings on display at LA Artcore Gallery are made of movements and spaces. The style is uncluttered, but don’t mistake the spread of solid colors on either side of the canvas for any minimalist layout. At this point, the natural reaction of the viewer is to step forward, beckoned by lines that could be curved by some countryside zephyr. Slowly, it becomes clear that the frayed lines are in fact small, aligned dots, reminiscent of traditional designs of Native Australians, though the artist uses them her own different way. Kolo’s work is rife with contrasts: utilizing both between modern and traditional techniques, she creates artwork standing on the edge of paradoxes. Blurring the limits between abstraction and figuration, dynamism and stillness, black and white, doted lines offers any number of distinct impressions. 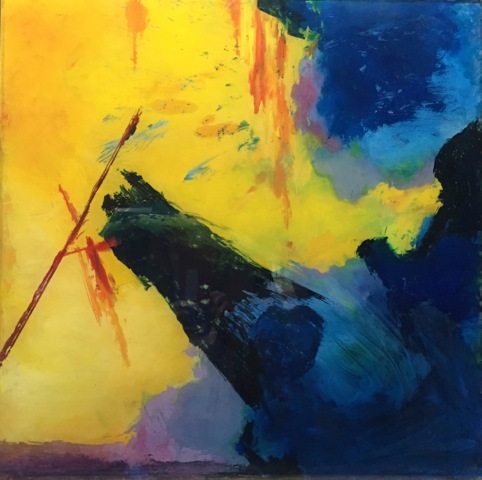 Some of the abstract pieces can transport the viewer to a wild, unkempt grassland, beneath a chaotic horizon sketched by a raving seismograph, the ground and sky inverted like a photo negative. A closer look, with the painting occupying a viewer’s entire field of vision, reveals the artist’s patient and precise technique. It’s not a minimal two-color process at all, but rather an almost pointillist application of numerous colored dots, some plotted with rigorous exactitude and others spattered on the canvas with seeming spontaneity: all these multiple and varied spots working together in harmonic rhythm. Kolo’s work is about distance and the movement it requires to be traversed. Put a point at the end of a sentence and it ends the sentence. Now put three points at the end of the same sentence to suggest continuity… She puts a thousand, a million points providing the dynamism it needs to blur the boundaries between things, like a landscape seen by a passenger through the window of a speeding train, or the twilight fading in and out in by the movement of the Earth. When the artist utilizes her distinctive technique for more figurative expression, flowers grow from a Rorschach action painting burst with saturated colors, depicting a life that would never be still. Points, dots, and spots in a multitude of sizes and colors, are so vibrant you could drown in their "farandole".